On Monday, June 18th, Mayor Mike Spano, along with Yonkers’ teens, Beczak Environmental Education Center, and Groundwork Hudson Valley staff discovered fish that are already swimming in the newly daylighted Saw Mill River. 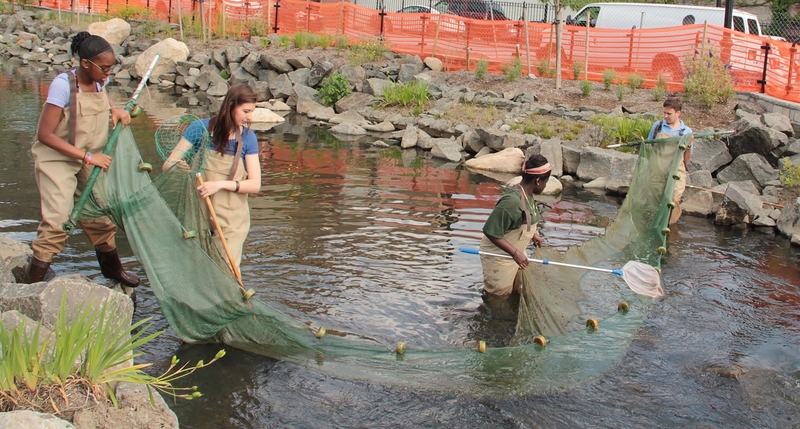 Students from Yonkers, Gordon, Saunders, and Hackley high schools and Oberlin College donned waders and learned how to capture fish in a seining net. Several discoveries were made, including several baby nursery black-nose dace and tessellated darters, which are thriving in the rocks placed along the river for several species of fish to come and grow. 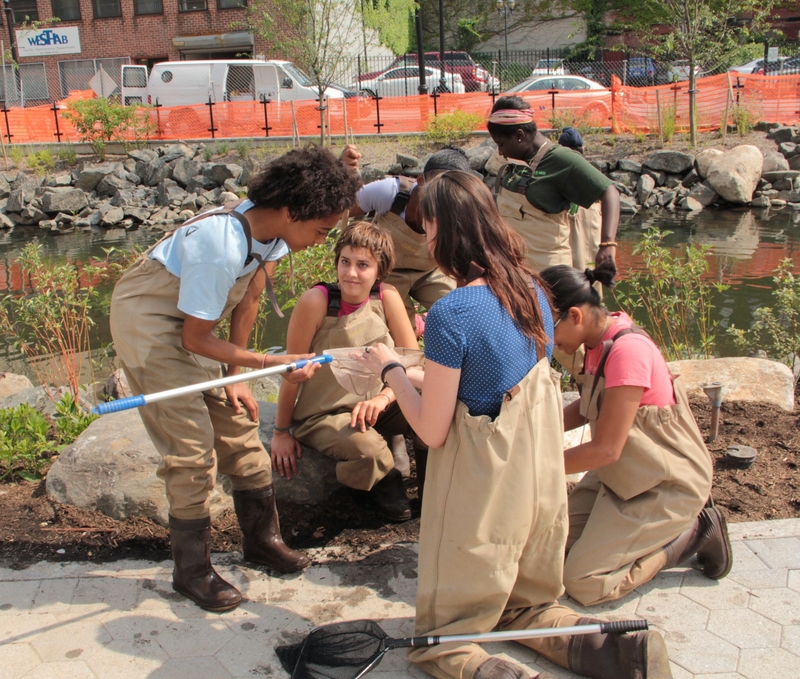 “The fact that fish are alive and well in such an urban area—downtown Yonkers—is magic, and we are excited about sharing this magic with our youth,” related Ann-Marie Mitroff, River Program Director of Groundwork Hudson Valley. This spring, students working with Groundwork Hudson Valley caught many baby glass eels at the mouth of the Saw Mill River. The eels migrate from 600 miles away to grow to adulthood in the Saw Mill. Mayor Spano watched the seining at the water’s edge, and spoke with the students on hand. “This is such a fantastic idea that has been in the works for many years. We are going to continue daylighting the river, because it’s such a great resource for the city. It shows the beauty of Yonkers and will help Yonkers become a destination,” said Mayor Spano. The park, which will be open to the public once final details are finished, will provide a place to teach about the natural environment and Yonkers’ history. To support that goal, the American Eel Outdoor Classroom is being installed by Groundwork Hudson Valley under a grant from the Hudson River Foundation and the US EPA. The classroom area in the park will have benches to accommodate school and summer camp classes visiting Beczak Environmental Education Center, The Science Barge, and Philipse Manor Hall. It will also feature an in-ground mosaic depicting the life cycle of the American Eel. The area will also be used by the Yonkers Riverfront Library for story hours. The Daylighting project culminates a 10-year effort to uncover portions of the river buried for decades by urban construction, making the way for the new park that will help spur Downtown Yonkers’ revitalization. Spano and the students were filmed by Canadian documentary company Catbird Productions, which has been following the Daylighting project from start to finish. Their film, Under the City, is documenting rivers that have been buried in cities all around the world. Filming is set for completion at the end of June and will air on French CBC TV and online soon. According to Katarina Soukup, Catbird Producer and President, “Today is the end of a story—the big reveal. In cities around the world we often see great ideas for revitalizing abandoned rivers, but the political will to bring these ideas to life is not there. That’s what is so inspiring here in Yonkers. Environmentalists, engineers, and politicians worked together over these many months, and their collaborative effort has born fruit in this beautiful park. What a wonderful thing, seeing these inner city kids learning about nature, and having access to the river. Next summer we’d like to come back and present an outdoor screening of our completed film in the Daylighting Park. This entry was posted on Thursday, June 28th, 2012 at 3:58 pm	and is filed under News. You can follow any responses to this entry through the RSS 2.0 feed. Both comments and pings are currently closed.